This post is sponsored in conjunction with #BrunchWeek. I received product samples from sponsor companies to aid in the creation of the #Brunchweek recipes. All opinions are mine alone. My husband and I have been on our weight loss journey for a few months now. While my weight has gone down 20ish lbs, I’m also excited to see the non-scale victories. I was having random aches/pains, my jeans were tight, none of my dresses fit and I just felt so blah. I also can’t eat nearly as much as I used to be able to. The portion control has been helping! I love being back on track again and enjoying healthier foods, like this great smoothie! Since the weather is warming up, I just had to fork out the blender. 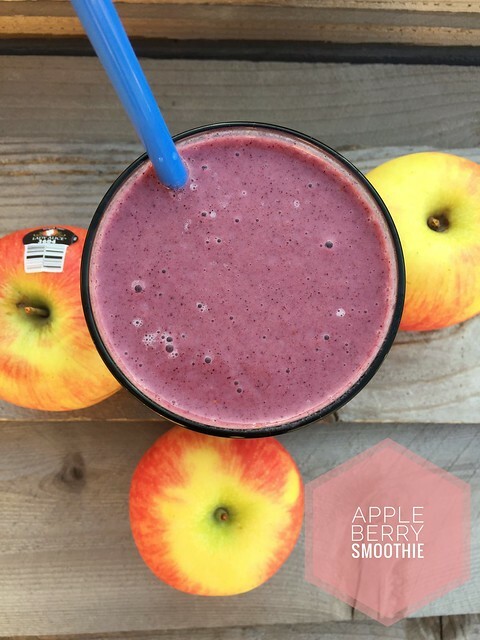 I love the combination of apples with berries, so I had to make this into a smoothie! The wonderful thing about using frozen berries is that you don’t even need to use ice! So it’s chock-full of fruity flavors! After I drank this, I actually felt super full afterwards. This simple smoothie includes Rainier Fruit’s Lady Alice Apples, frozen berries, vanilla yogurt, milk & honey. It couldn’t be any easier to make, and it’s absolutely delicious! Add all ingredients to a blender, and turn the blender on medium speed until the ingredients are well-blended. Then, blend everything on high speed until no chunks remain. Enjoy! To celebrate #brunchweek, our generous sponsors are offering some amazing prizes for you to enter to win! For a chance to win, go to this post and enter using the Rafflecopter widget! Take a look at what the #BrunchWeek Bloggers are creating today! Disclaimer: Thank you to #BrunchWeek Sponsors: Red Star Yeast, Dixie Crystals, Cabot Cheese, Nielsen-Massey, Rainier Fruit, and Michigan Asparagus for providing the prizes free of charge. These companies also provided the bloggers with samples and product to use for #BrunchWeek recipes. All opinions are my own. The #BrunchWeek giveaway is open to U.S. residents, age 18 & up. All entries for the winner will be checked and verified. By entering you give the right to use your name and likeness. The number of entries received determines the odds of winning. Six winners will be selected. The prize packages will be sent directly from the giveaway sponsors. The #BrunchWeek Bloggers are not responsible for the fulfillment or delivery of the prize packages. Bloggers hosting this giveaway and their immediate family members in their household cannot enter or win the giveaway. No purchase necessary. Void where prohibited by law. This promotion is in no way sponsored, endorsed or administered by, or associated with Facebook, Instagram, Pinterest, or any other social channel mentioned in the #Brunchweek posts or entry. Love smoothies and this one sounds wonderful. Yum! This is so pretty and sounds delicious! I love having smoothies in the morning! This one looks great!